St. Jude Medical, Inc. (NYSE:STJ), a global medical device company, today announced the U.S. Food and Drug Administration (FDA) approval and launch of the AMPLATZER™ PFO Occluder to help reduce the risk of recurrent ischemic strokes in patients diagnosed with a patent foramen ovale (PFO) - a small opening between the upper chambers of the heart. With the approval of the AMPLATZER PFO Occluder, patients in the U.S. with a PFO who have suffered an ischemic stroke - a stroke resulting from blockages in the blood supply to the brain - will now have access to a closure device proven to reduce their risk of recurrent stroke rather than relying on medical management alone. When a person suffers an ischemic stroke with no initial attributable cause (known as a cryptogenic stroke), physicians will run tests to assess any underlying risk factors. These tests will include a test to determine if the patient has a PFO. Researchers long suspected a correlation between the presence of a PFO and the risk of a patient suffering an ischemic stroke; nearly half of all people who suffer a cryptogenic stroke also have a PFO. Normally in a developing fetus, the foramen ovale allows oxygenated blood from the placenta to bypass the lungs. This small, flap-like opening typically closes shortly after birth. When this flap remains open, or "patent," it is referred to as a PFO. A PFO can potentially allow dangerous clots to pass from the right side of the heart to the left, travel up to the brain and cause a stroke. 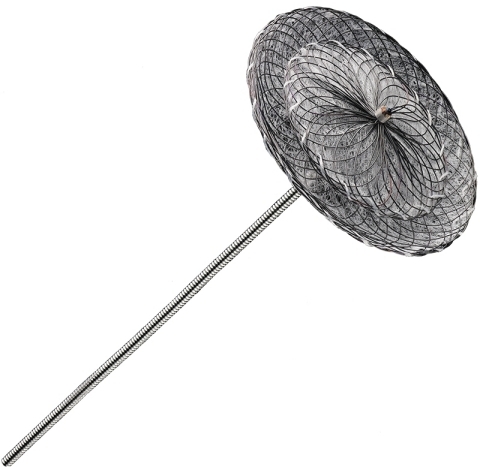 The AMPLATZER PFO Occluder is the only device approved in the United States for PFO closure and has been shown to lower the risk of stroke by sealing the unwanted hole between the left and right chambers of the heart. "This is a well-studied therapy with a strong safety profile," said Jeffrey L. Saver, MD, director of the stroke center at UCLA and professor of neurology at David Geffen School of Medicine. "Given what we know about the devastating effects of ischemic stroke, the AMPLATZER PFO Occluder is a compelling treatment option in preventing another stroke for patients with a history of cryptogenic stroke and a PFO who are otherwise young and healthy." Data from the RESPECT trial, an eight-year clinical study of nearly one thousand patients diagnosed with both PFO and cryptogenic stroke, demonstrated PFO closure provides a clinically meaningful patient benefit over medical management alone, and that PFO closure with the AMPLATZER PFO Occluder reduced the risk of recurrent stroke by over half compared to standard medical treatment. "Interventional cardiology and vascular neurology in major US and Canadian medical centers have worked together for over a decade to develop the scientific proof from this randomized trial that PFO closure substantially reduces the risk of recurrent stroke in these otherwise healthy patients," said John D. Carroll, MD, director of interventional cardiology and the Cardiac and Vascular Center at the University of Colorado Hospital. "The Amplatzer PFO Occluder procedure takes less than one hour to complete, can be performed with conscious sedation and subsequently provides these patients with over a 50% reduction of risk for having another stroke for many years to come." In May 2016, an FDA advisory panel met to discuss the benefits and risks of the AMPLATZER PFO Occluder for treatment of recurrent stroke in patients with a PFO. The panelists concluded that PFO closure is an important medical therapy and offers clinically meaningful benefits for patients with a PFO who are at risk for recurrent stroke. The panel voted in favor of the device's safety, effectiveness and that the benefits of PFO closure with the AMPLATZER PFO Occluder outweigh the risks. "The AMPLATZER PFO Occluder underscores St. Jude Medical's commitment to advancing therapies designed to improve long term quality of life and reduce health care costs," said Mark D. Carlson, M.D., chief medical officer at St. Jude Medical. "The approval of the AMPLATZER PFO Occluder is an important step for patients living in fear of recurrent stroke as a result of a PFO, and offers physicians more options to help their patients make decisions that best fit their lives."